Can I Legally Light Off Fireworks In My State? What About Sparklers? Though some of you will mark the July 4th holiday by illegally tossing cherry bombs off your roof, we know that most of you want to do things the safe and legal way. Of course, the particulars of what you’re allowed to set off depends a lot on where you live. According to the American Pyrotechnics Association [PDF], there are 42 states (and Washington, D.C.) that allow some sort of consumer fireworks. 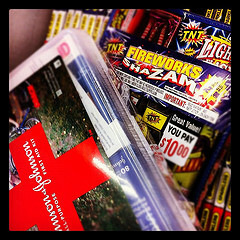 The remaining 8 states are divided equally between the “Sparkler States” — Illinois, Iowa, Ohio, Vermont — that only permit sparklers and other novelty items, and what I’ve personally labeled the “No Fun On the Fourth States” — Delaware, New Jersey, New York, and Massachusetts — that don’t allow any consumer fireworks. But even among the 42 states and D.C. that allow for fireworks fun, there is great variation in what’s permitted. Thankfully, the helpful folks at the APA have put together a state-by-state guide so you can see what’s allowed in your neck of the woods. For example, while Pennsylvania is effectively a sparkler/novelty-only state, you can apply for a display permit from the authorities in whichever municipality you want to set off your consumer fireworks. Then there are states like Wyoming where it simply says that you’re allowed to set off any consumer fireworks that meet the requirements of the Consumer Product Safety Commission. Regardless of which fireworks you’re allowed to set off, we hope that you do so safely. Last year, nearly 9,000 Americans were treated at emergency rooms for fireworks-related injuries and you don’t want to be one of the people on the tally for 2013, do you? The CPSC has a whole section of its site dedicated to fireworks safety; it couldn’t hurt to give it a read.